6324 Renegade's Raft is a Pirates set released in 1991. The set features 37 pieces and 1 minifigure, First Mate Rummey. The set also features a shark. 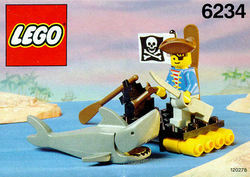 The minifigure rides on a raft, has a blue torso light gray pants and a brown cap he welds a sword and a pistol to fight of the shark. Facts about "6234 Renegade's Raft"
This page was last edited on 28 April 2016, at 22:06.